The Khrushchev Thaw (or Khrushchev's Thaw; Russian: хрущёвская о́ттепель, tr. khrushchovskaya ottepel, IPA: [xrʊˈɕːɵfskəjə ˈotʲ:ɪpʲɪlʲ] or simply ottepel) refers to the period from the early 1950s to the early 1960s when repression and censorship in the Soviet Union were relaxed, and millions of Soviet political prisoners were released from Gulag labor camps due to Nikita Khrushchev's policies of de-Stalinization and peaceful coexistence with other nations. The Thaw became possible after the death of Joseph Stalin in March 1953. First Secretary Khrushchev denounced former General Secretary Stalin in "The Secret Speech" at the 20th Congress of the Communist Party, then ousted the pro-Stalinists during his power struggle in the Kremlin. 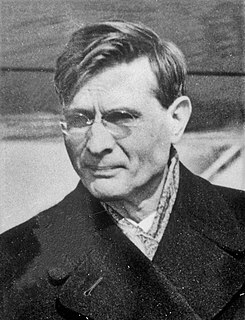 The term was coined after Ilya Ehrenburg's 1954 novel The Thaw ("Оттепель"), sensational for its time. 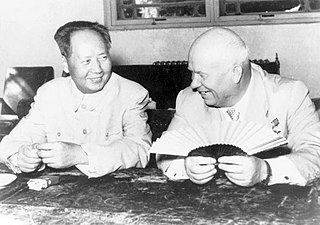 The Khrushchev Thaw was highlighted by Khrushchev's 1954 visit to Beijing, People's Republic of China, his 1955 visit to Belgrade, Yugoslavia (with whom relations had soured since the Tito–Stalin Split in 1948), and his subsequent meeting with Dwight Eisenhower later that year, culminating in Khrushchev's 1959 visit to the United States. The Thaw initiated irreversible transformation of the entire Soviet society by opening up for some economic reforms and international trade, educational and cultural contacts, festivals, books by foreign authors, foreign movies, art shows, popular music, dances and new fashions, and massive involvement in international sport competitions. Although the power struggle between pro-Khrushchev and pro-Stalinists never stopped, it eventually weakened the Soviet Communist Party. The Thaw allowed some freedom of information in the media, arts, and culture; international festivals; foreign films; uncensored books; and new forms of entertainment on the emerging national TV, ranging from massive parades and celebrations to popular music and variety shows, satire and comedies, and all-star shows like Goluboy Ogonyok. Such political and cultural updates all together helped liberate the minds of millions and changed public consciousness of several generations of people in the Soviet Union. The Thaw was reverted shortly after Khrushchev was succeeded by Leonid Brezhnev, as he reversed the liberalization of the union, albeit going against his endorsement of the Thaw during the Khrushchev era. Stalin's leadership had reached new extremes in ruling people at all levels, such as the deportations of nationalities, the Leningrad Affair, the Doctors' plot, and official criticisms of writers and other intellectuals. At the same time, millions of soldiers and officers had seen Europe after World War II, and had become aware of different ways of life which existed outside the Soviet Union. Upon Stalin's orders many were arrested and punished again, including the attacks on the popular Marshal Georgy Zhukov and other top generals, who had exceeded the limits on taking trophies when they looted the defeated nation of Germany. The loot was confiscated by Stalin's security apparatus, and Marshal Zhukov was demoted, humiliated and exiled; he became a staunch anti-Stalinist. Zhukov waited until the death of Stalin, which allowed Khrushchev to bring Zhukov back for a new political battle. Khrushchev also promoted and groomed Leonid Brezhnev, whom he brought to the Kremlin and introduced to Stalin in 1952. Then Khrushchev promoted Brezhnev to Presidium (Politburo) and made him the Head of Political Directorate of the Red Army and Navy, and moved him up to several other powerful positions. Brezhnev in return helped Khrushchev by tipping the balance of power during several critical confrontations with the conservative hard-liners, including the ouster of pro-Stalinists headed by Molotov and Malenkov. Khrushchev denounced Stalin in his speech On the Cult of Personality and Its Consequences, delivered at the closed session of the 20th Party Congress, behind closed doors, after midnight on 25 February 1956. In this speech, Khrushchev described the damage done by Joseph Stalin's cult of personality, and the repressions, known as the Great Purge that killed millions and traumatized many people in the Soviet Union. After the delivery of the speech, it was officially disseminated in a shorter form among members of the Soviet Communist Party across the USSR starting 5 March 1956. Then Khrushchev initiated a wave of rehabilitations that officially restored the reputations of many millions of innocent victims, who were killed or imprisoned in the Great Purge under Stalin. Further, tentative moves were made through official and unofficial channels to relax restrictions on freedom of speech that had been held over from the rule of Stalin. Khrushchev's 1956 speech was the strongest effort ever in the USSR to bring political change, at that time, after several decades of fear of Stalin's rule, that took hundreds of thousands of innocent lives. Khrushchev's speech was published internationally within a few months, and his initiatives to open and liberalize the USSR had surprised the world. Khrushchev's speech had angered many of his powerful enemies, thus igniting another round of ruthless power struggle within the Soviet Communist Party. Khrushchev's denouncement of Stalin came as a shock to the Soviet people. Many in Georgia, Stalin's homeland, especially the young generation, bred on the panegyrics and permanent praise of the "genius" of Stalin, perceived it as a national insult. In March 1956, a series of spontaneous rallies to mark the third anniversary of Stalin's death quickly evolved into an uncontrollable mass demonstration and political demands such as the change of the central government in Moscow and calls for the independence of Georgia from the Soviet Union appeared, leading to the Soviet army intervention and bloodshed in the streets of Tbilisi. The Hungarian Revolution of 1956 was suppressed by a massive invasion of Soviet tanks and Red Army troops in Budapest. 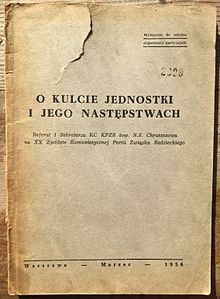 The street fighting against the invading Red Army caused thousands of casualties among Hungarian civilians and militia, as well as hundreds of the Soviet military personnel killed. The attack by the Soviet Red Army also caused massive emigration from Hungary, as hundreds of thousands of Hungarians had fled as refugees. At the same time, the Polish October emerged as the political and social climax in Poland. Such democratic changes in the internal life of Poland were also perceived with fear and anger in Moscow, where the rulers did not want to lose control, fearing the political threat to Soviet security and power in Eastern Europe. But Khrushchev had used Marshal Georgy Zhukov again. Khrushchev was saved by several strong appearances in his support – especially powerful was support from both Zhukov and Mikoyan. At the extraordinary session of the Central Committee held in late June 1957, Khrushchev labeled his opponents the Anti-Party Group and won a vote which reaffirmed his position as First Secretary. Then he expelled Molotov, Kaganovich and Malenkov from the Secretariat and ultimately from the Communist Party itself. In 1956, Khrushchev introduced the concept of a minimum wage. The idea was met with much criticism with communist hardliners, they claimed that the minimum wage was so small, that most people were still underpaid in reality. The next step was a contemplated financial reform. However, Khrushchev stopped short of real monetary reform, when he ordered the replacement of old money bearing portraits of Stalin, and made a simple redenomination of the ruble 10:1 in 1961. In 1961, Khrushchev finalized his battle against Stalin: the body of the dictator was removed from Lenin's Mausoleum on the Red Square and then buried outside the walls of the Kremlin. The removal of Stalin's body out of Lenin's Mausoleum was arguably among the most provocative moves made by Khrushchev during the Thaw. The removal of Stalin's body consolidated pro-Stalinists against Khrushchev, and alienated even his loyal apprentices, such as Leonid Brezhnev. The era of the Cultural Thaw ended in December 1962 after the Manege Affair. Despite these liberalizing reforms in music, many argue that Khrushchev's legislation of the arts was based, less on freedom of expression of the Soviet people, and too much on his own personal tastes. Following the emergence of some unconventional, avant-garde music as a result of his reforms, on 8 March 1963, Khrushchev delivered a speech which began to reverse some of his de-Stalinization reforms. In his speech, he stated: "We flatly reject this cacophonous music. Our people can't use this garbage as a tool for their ideology." He claimed: "Society has a right to condemn works which are contrary to the interests of the people." Although the Thaw was considered a time of openness and liberalization, Khrushchev continued to place restrictions on these newfound freedoms. Nonetheless, despite Khrushchev's inconsistent liberalization of musical expression, his speeches were not so much "restrictions" as "exhortations". Artists, and especially musicians, were provided access to resources that had previously been censored or altogether inaccessible prior to Khrushchev's reforms. The composers of this time, for example, were able to access scores by composers such as Arnold Schoenberg and Pierre Boulez, gaining inspiration from and imitating previously concealed musical scores. As Soviet composers gained access to new scores and were given a taste of freedom of expression during the late 1950s, two separate groups began to emerge. One group wrote predominantly "official" music which was "sanctioned, nourished, and supported by the Composers' Union". The second group wrote "unofficial", "left", "avant-garde", or "underground" music, marked by a general state of opposition against the Soviet Union. Although both groups are widely considered to be interdependent, many regard the unofficial music scene as more independent and politically influential than the former in the context of the Thaw. The unofficial music that emerged during the Thaw was marked by the attempt, whether successful or unsuccessful, to reinterpret and reinvigorate the "battle of form and content" of the classical music of the period. Although the term "unofficial" implies a level of illegality involved in the production of this music, composers, performers, and listeners of "unofficial" music actually used "official" means of production. Rather, the music was considered unofficial within a context that counteracted, contradicted, and redefined the socialist realist requirements from within their official means and spaces. Unofficial music emerged in two distinct phases. The first phase of unofficial music was marked by performances of "escapist" pieces. From a composer's perspective, these works were escapist in the sense that their sound and structure withdrew from the demands of socialist realism. Additionally, pieces developed during this phase of unofficial music allowed the listeners the ability to escape the familiar sounds that Soviet officials officially sanctioned. The second phase of unofficial music emerged during the late 1960s, when the plots of the music became more apparent, and composers wrote in a more mimetic style, writing in contrast to their earlier compositions of the first phase. Throughout the musical Thaw, the generation of "young composers" who had matured their musical tastes with broader access to music that had previously been censored was the prime focus of the unofficial music scene. The Thaw allowed these composers the freedom to access old and new scores, especially those originating in the Western avant-garde. During the late 1950s and early 1960s, young composers such as Andrei Volkonsky and Edison Denisov, among others, developed abstract musical practices that created sounds that were new to the common listener's ear. Socialist realist music was widely considered "boring", and the unofficial concerts that the young composers presented allowed the listeners "a means of circumventing, reinterpreting, and undercutting the dominant socialist realist aesthetic codes". Despite the seemingly rebellious nature of the unofficial music of the Thaw, historians debate whether the unofficial music that emerged during this time should truly be considered as resistance to the Soviet system. While a number of participants in unofficial concerts "claimed them to be a liberating activity, connoting resistance, opposition, or protest of some sort", some critics claim that rather than taking an active role in opposing Soviet power, composers of unofficial music simply "withdrew" from the demands of the socialist realist music and chose to ignore the norms of the system. Although Westerners tend to categorize unofficial composers as "dissidents" against the Soviet system, many of these composers were afraid to take action against the system in fear that it might have a negative impact on their professional advancement. Many composers favored a less direct, yet significant method of opposing the system through their lack of musical compliance. Regardless of the intentions of the composers, the effect of their music on audiences throughout the Soviet Union and abroad "helped audiences imagine alternative possibilities to those suggested by Soviet authorities, principally through the ubiquitous stylistic tropes of socialist realism". Although the music of the younger generation of unofficial Soviet composers experienced little widespread success in the West, its success within the Soviet Union was apparent throughout the Thaw (Schwarz 423). Even after Khrushchev's fall from power in October 1964, the freedoms that composers, performers, and listeners felt through unofficial concerts lasted into the 1970s. 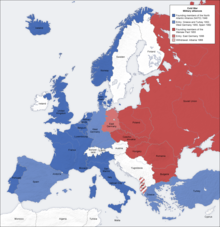 The death of Stalin in 1953 and the twentieth CPSU congress of February 1956 had a huge impact throughout Eastern Europe. Literary thaws actually preceded the congress in Hungary, Poland, Bulgaria, and the GDR and later burgeoned briefly in Czechoslovakia and Chairman Mao's China. With the exception of the arch Stalinist and anti-Titoist Albania, Romania was the only country where intellectuals avoided an open clash with the regime, influenced partly by the lack of any earlier revolt in post-war Romania that would have forced the regime to make concessions. In the West, Khrushchev's Thaw is known as a temporary thaw in the icy tension between the United States and the USSR during the Cold War. The tensions were able to thaw because of Khrushchev's de-Stalinization of the USSR and peaceful coexistence theory and also because of US President Eisenhower's cautious attitude and peace attempts. For example, both leaders attempted to achieve peace by attending the 1955 Geneva International Peace Summit and developing the Open Skies Policy and Quest for Arms Agreement. The leaders' attitudes allowed them to, as Khrushchev put it, "break the ice." Khrushchev's Thaw caused unprecedented social, cultural and economic transformations in the Soviet Union. The 60s generation actually started in the 1950s, with their uncensored poetry, songs and books publications. In 1959, the American National Exhibition came to Moscow with the goals of displaying United States' productivity and prosperity. The latent goal of the Americans was to get the Soviet Union to reduce production of heavy industry. If the Soviet Union started putting their resources towards producing consumer goods, it would also mean a reduction of war materials. An estimated number of over twenty million Soviet citizens viewed the twenty-three U.S. exhibitions during a thirty-year period. These exhibitions were part of the Cultural Agreement formed by the United States and the Soviet Union in order to acknowledge the long-term exchange of: science, technology, agriculture, medicine, public health, radio, television, motion pictures, publications, government, youth, athletics, scholarly research, culture, and tourism. In addition to the influences of European and Western culture, the spoils of the Cold War exposed the Soviet people to a new way of life. Through motion pictures from the United States, viewers learned of another way of life. The Kitchen Debate at the 1959 Exhibition in Moscow fueled Khrushchev to catch up to Western consumerism. The "Khrushchev regime had promised abundance to secure its legitimacy." The ideology of strict functionality concerning material goods evolved into a more relaxed view of consumerism. American sociologist David Riesman coined the term "Operation Abundance" also known as the "Nylon War" which predicted "Russian people would not long tolerate masters who gave them tanks and spies instead of vacuum cleaners and beauty parlors." The Soviets would have to produce more consumer goods to quell mass discontent. Riesman's theory came true to some extent as the Soviet culture changed to include consumer goods such as vacuum cleaners, washing machines, and sewing machines. These items were specifically targeted at women in the Soviet Union with the idea that they relieved women of their domestic burden. Additionally an interest in changing the western image of a dowdy Russian woman led to the cultural acceptance of beauty products. The modern Russian woman wanted the clothing, cosmetics, and hairstyles available to Western women. Under the Thaw, beauty shops selling cosmetics and perfume, which had previously only been available to royalty[clarification needed], became available for women. Khrushchev responded to consumerism more diplomatically than to cultural consumption. In response to American jazz Khrushchev stated: "I don't like jazz. When I hear jazz, it's as if I had gas on the stomach. I used to think it was static when I heard it on the radio." Concerning commissioning artists during the Thaw, Khrushchev declared: "As long as I am president of the Council of Ministers, we are going to support a genuine art. We aren't going to give a kopeck for pictures painted by jackasses." In comparison, the consumption of material goods acted as a measure of economic success. Khrushchev stated: "We are producing an ever-growing quantity of all kinds of consumer goods; all the same, we must not force the pace unreasonably as regards the lowering of prices. We don't want to lower prices to such an extent that there will be queues and a black market." Previously, excessive consumerism under Communism was seen as detrimental to the common good. Now, it was not enough for the consumer goods to be made more available; quality of consumer goods needed to be raised as well. A misconception surrounding the quality of consumer goods existed because of advertising's role in the market. Advertising controlled sale quotas by increasing the desirability of surplus sub-standard goods. On 31 July 1957 the Communist party decreed to increase housing construction and Khrushchev launched plans for building private apartments that differed from the old, communal apartments that had come before. Khrushchev stated that it was important "not only to provide people with good homes, but also to teach them…to live correctly." He saw a high living standard as a precondition leading the path on the transition to full communism and believed that private apartments could achieve this. Although the Thaw marked a time of openness and liberalization primarily located in the public sphere, the emergence of private housing allowed for a new formulation of a private sphere in Soviet life. This resulted in a changing ideology that needed to make room for women, who were traditionally associated with the home, and consumption of goods in order to create a well-ordered "Soviet" home. Khrushchev's policies showed an interest in rebuilding the home and the family after the devastation of World War II. Soviet rhetoric exemplified a shift in emphasis from heavy industry to the importance of consumer goods and housing. The Seven-Year Plan was launched in 1958 and promised to build 12 million city apartments and 7 million rural houses. Alongside the increased number of private apartments was the emergence of changing attitudes toward the family. The prior Soviet ideology disdained conceptions of the traditional family, especially under Stalin, who created the vision of a large, collective family under his paternal leadership. The new emphasis on private housing created hope that the Thaw-era private realm would provide an escape from the intensities of public life and the eye of the government. Indeed, Khrushchev introduced the ideology that private life was valued and was ultimately a goal of social development. The new political rhetoric regarding the family reintroduced the concept of the nuclear family, and, in doing so, cemented the idea that the women were responsible for the domestic realm and running the home. Recognizing the necessity of rebuilding the family in the postwar years, Khrushchev enacted policies that attempted to reestablish a more conventional domestic realm, moving away from the policies of his predecessors, and most of these were aimed at women. Despite being an active part of the workforce, women's conditions were considered by the western, capitalist world to exemplify the "backwardness" of the Soviet Union. This concept goes back to traditional Marxism, which found the roots of woman's inherent backwardness in fact that she was confined to the home; Lenin spoke of woman as a "domestic slave" who would remain in confinement as long as housework remained an activity for individuals inside the home. The prior abolition of private homes and the individual kitchen attempted to move away from the domestic regime that imprisoned women. Instead, the government tried to implement public dining, socialized housework, and collective childcare. These programs that fulfilled the original tenets of Marxism were widely resisted by traditionally-minded women. In March 1958, Khrushchev admitted to the Supreme Soviet his embarrassment about the public perception of Soviet women as unhappily relegated to the ranks of a manual laborer. The new private housing provided individual kitchens for many families for the first time. The new technologies of the kitchen came to be associated with the projects of modernization in the era of the Cold War's "peaceful competition." In this time, the primary competition between the U.S. and the Soviet Union was the battle of providing the better quality of life. In 1959, at the American National Exhibition in Moscow, U.S. Vice-President Richard Nixon declared the superiority of the capitalist system while standing in front of an example of a modern American kitchen. Known as the "Kitchen Debate," the exchange between Nixon and Khrushchev foreshadowed Khrushchev's increased attention to the needs of women, especially by creating modern kitchens. 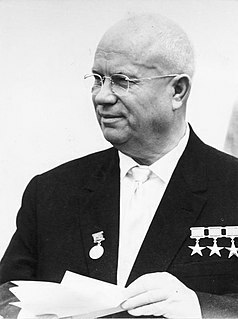 While affirming his dedication to increasing the living standard, Khrushchev associated the transition to communism with abundance and prosperity. The Third Party Programme of 1961, the defining document of Khrushchev's policies, related social progress with technological progress, especially technological progress inside the home. Khrushchev spoke of a commitment to increasing production of consumer goods, specifically household goods and appliances that would decrease the intensity of housework. The kitchen was defined as a "workshop" that relied on the "correct organization of labour" to be most efficient. Creating what were perceived to be the best conditions for the woman's work in the kitchen was an attempt on the part of the government to ensure that the Soviet woman would be able to continue her labor inside and outside of the home. Despite the increasing demands of housework, women were expected to maintain jobs outside the home in order to sustain the national economy as well as fulfill the ideals of a Soviet well-rounded individual. During this time, women were flooded with pamphlets and magazines teeming with advice on how best to run a household. This literature emphasized the virtues of simplicity and efficiency. Additionally, furniture was designed to suit the average height of Moscow women, emphasizing a modern, simple style that allowed for efficient mass production. However, in the newly built apartments of the Khrushchev era, the individual kitchens were rarely up to the standards invoked by the government's rhetoric. Providing fully fitted kitchens were too expensive and time-consuming to be realized in the mass housing project. The streamlined, simple design and aesthetic of the kitchen was promoted throughout the rest of the home. Previous styles were labeled as petit-bourgeois once Khrushchev came to power. Khrushchev denounced the ornate style of high Stalinism for its wastefulness. The arrangement of the home during the Thaw emphasized that which was simple and functional, for those items could be easily mass-produced. Khrushchev promoted a culture of increased consumption and publicly announced that the per capita consumption of the Soviet Union would exceed that of the United States. However, consumption consisted of modern goods that lacked decorative qualities and were often poor quality, which spoke to the society's emphasis on production rather than consumption. Both the cultural and the political thaws were effectively ended with the removal of Khrushchev as Soviet leader in October 1964, and the installment of Leonid Brezhnev as General Secretary of the Communist Party of the Soviet Union in 1964. 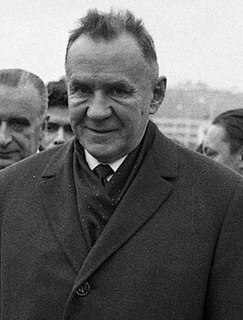 When Khrushchev was dismissed, Alexei Kosygin took over Khrushchev's position as Soviet Premier, but Kosygin's economic reform was not successful and hardline communists led by Brezhnev blocked any motions for reforms after Kosygin's failed attempt. 1954: Khrushchev visited Beijing, China, met Chairman Mao Zedong. Started rehabilitation and release of Soviet political prisoners. Allowed uncensored public performances of poets and songwriters in the Soviet Union. 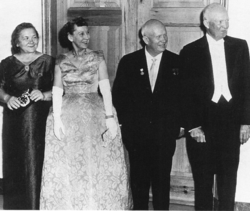 1959: Khrushchev visited the US. Unsuccessful introduction of maize during agricultural crisis in the Soviet Union caused serious food crisis. Sino-Soviet split started. Mikhail Gorbachev has called Khrushchev's achievements remarkable; he praised Khrushchev's 1956 speech, but stated that Khrushchev did not succeed in his reforms. ^ Khrushchev, Sergei N., translated by William Taubman, Khrushchev on Khrushchev, Boston: Little, Brown and Company, 1990. ^ Rettie, John. "How Khrushchev Leaked his Secret Speech to the World", Hist Workshop J. 2006; 62: 187–193. ^ Ilya Ehrenburg (1954). "Оттепель" [The Thaw (text in original Russian)]. lib.ru (in Russian). Retrieved 10 October 2004. ^ Stites, Richard (1992). Russian Popular Culture: Entertainment and Society Since 1900. Cambridge University Press. pp. 123–53. ISBN 052136986X. Retrieved 27 June 2015. ^ Khrushchev, Sergei N., Nikita Khrushchev and the Creation of a Superpower, Penn State Press, 2000. ^ a b c Aleksandr Solzhenitsyn (1974). The Gulag Archipelago. Harper & Row. ISBN 978-0060007768. ^ Vladimir Karpov. (Russian source: Маршал Жуков: Опала, 1994) Moscow, Veche publication. ^ World Affairs. 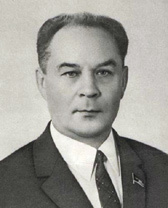 Leonid Brezhnev. ^ a b c d e f g h i j Russian source: Factbook on the history of the Communist Party and the Soviet Union. Справочник по истории Коммунистической партии и Советского Союза 1898 - 1991. ^ Gati, Charles (2006). Failed Illusions: Moscow, Washington, Budapest and the 1956 Hungarian Revolt. Stanford University Press. ISBN 0-8047-5606-6. ^ Stalinism in Poland, 1944-1956, ed. and tr. by A. Kemp-Welch, St. Martin's Press, New York, 1999, ISBN 0-312-22644-6. ^ a b Mikhail Gorbachev. The first steps towards a new era. Guardian. ^ Moscow marks 50 years since youth festival. ^ a b c d e f g h i j k l Schmelz, Peter (2009). Such freedom, if only musical: Unofficial Soviet Music during the Thaw. New York, NY: Oxford University Press. pp. 3–25. ^ a b c Schwarz, Boris (1972). Music and Musical Life in Soviet Russia 1917-1970. New York, NY: N.W. Norton. pp. 416–439. ^ a b Schmelz, Peter (2009). From Scriabin to Pink Floyd The ANS Synthesizer and the Politics of Soviet Music between Thaw and Stagnation. Oxford: Oxford University Press. pp. 254–272. ^ McBurney, Gerald (123–124). Soviet Music after the Death of Stalin: The Legacy of Shostakovich. Oxford: Oxford University Press Inc. pp. 123–124. ^ Kennedy, Robert F. Thirteen Days: A Memoir of the Cuban Missile Crisis; ISBN 0-393-31834-6. ^ a b Richmond, Yale, "The 1959 Kitchen Debate (or, how cultural exchanges changed the Soviet Union)," Russian Life 52, no. 4 (2009), 47. ^ Richmond, Yale, "The 1959 Kitchen Debate (or, how cultural exchanges changed the Soviet Union)," Russian Life 52, no. 4 (2009), 45. ^ Brusilovskaia, Lidiia, "The Culture of Everyday Life During the Thaw," Russian Studies in History 48, no. 1 (2009) 19. ^ Reid, Susan, "Cold War in the Kitchen: Gender and the De-Stalinization of Consumer Taste in the Soviet Union under Khrushchev," Slavic Review 61, no. 2 (2002), 242. ^ David Riesman as quoted in Reid, Susan, "Cold War in the Kitchen: Gender and the De-Stalinization of Consumer Taste in the Soviet Union under Khrushchev," Slavic Review 61, no. 2 (2002), 222. ^ Reid, Susan, "Cold War in the Kitchen: Gender and the De-Stalinization of Consumer Taste in the Soviet Union under Khrushchev," Slavic Review 61, no. 2 (2002), 233. ^ a b Johnson, Priscilla, Khrushchev and the Arts (Cambridge: The M.I.T. Press, 1965), 102. ^ Reid, Susan, "Cold War in the Kitchen: Gender and the De-Stalinization of Consumer Taste in the Soviet Union under Khrushchev," Slavic Review 61, no. 2 (2002), 237. ^ Reid, Susan, "Cold War in the Kitchen: Gender and the De-Stalinization of Consumer Taste in the Soviet Union under Khrushchev," Slavic Review 61, no. 2 (2002), 228. ^ McKenzie, Brent, "The 1960s, the Central Department Store and Successful Soviet Consumerism: the Case of Tallinna Kaubamaja—Tallinn's "Department Store", "International Journal of Interdisciplinary Social Sciences 5, no.9 (2011), 45. ^ McKenzie, Brent, "The 1960s, the Central Department Store and Successful Soviet Consumerism: the Case of Tallinna Kaubamaja—Tallinn's "Department Store", "International Journal of Interdisciplinary Social Sciences 5, no.9 (2011), 41. ^ McKenzie, Brent, "The 1960s, the Central Department Store and Successful Soviet Consumerism: the Case of Tallinna Kaubamaja—Tallinn's "Department Store", "International Journal of Interdisciplinary Social Sciences 5, no.9 (2011), 42. ^ Susan E. Reid, "The Khrushchev Kitchen: Domesticating the Scientific-Technological Revolution," Journal of Contemporary History 40 (2005), 295. ^ Susan E. Reid, "Cold War in the Kitchen: Gender and the De-Stalinization of Consumer Taste in the Soviet Union under Khrushchev," Slavic Review 61 (2002), 244. ^ Cold War in the Kitchen: Gender and the De-Stalinization of Consumer Taste in the Soviet Union under Khrushchev," Slavic Review 61.2 (2002): 115-16. ^ Lynne Attwood, "Housing in the Khrushchev Era" in Women in the Khrushchev Era, Melanie Ilic, Susan E. Reid, and Lynne Attwood, eds., (Houndmills: Palgrave Macmillan, 2004), 177. ^ Susan E. Reid, "The Khrushchev Kitchen: Domesticating the Scientific-Technological Revolution," Journal of Contemporary History 40 (2005), 289. ^ Iurii Gerchuk, "The Aesthetics of Everyday Life in the Khrushchev Thaw in the USSR (1954-64)" in Style and Socialism: Modernity and Material Culture in Post-War Eastern Europe, Susan E. Reid and David Crowley, eds., (Oxford: Berg, 2000), 88. ^ Natasha Kolchevska, "Angels in the Home and at Work: Russian Women in the Khrushchev Years," Women's Studies Quarterly 33 (2005), 115-17. ^ Susan E. Reid, "The Khrushchev Kitchen: Domesticating the Scientific-Technological Revolution," Journal of Contemporary History 40 (2005), 291-94. ^ Susan E. Reid, "Cold War in the Kitchen: Gender and the De-Stalinization of Consumer Taste in the Soviet Union under Khrushchev," Slavic Review 61 (2002), 224. ^ Susan E. Reid, "The Khrushchev Kitchen: Domesticating the Scientific-Technological Revolution," Journal of Contemporary History 40 (2005), 289-95. ^ Susan E. Reid, "Cold War in the Kitchen: Gender and the De-Stalinization of Consumer Taste in the Soviet Union under Khrushchev," Slavic Review 61 (2002), 223-24. ^ Susan E. Reid, "The Khrushchev Kitchen: Domesticating the Scientific-Technological Revolution," Journal of Contemporary History 40 (2005), 290-303. ^ Susan E. Reid, "Cold War in the Kitchen: Gender and the De-Stalinization of Consumer Taste in the Soviet Union under Khrushchev," Slavic Review 61 (2002), 244-49. ^ Susan E. Reid, "The Khrushchev Kitchen: Domesticating the Scientific-Technological Revolution," Journal of Contemporary History 40 (2005), 315. ^ Susan E. Reid, "The Khrushchev Kitchen: Domesticating the Scientific-Technological Revolution," Journal of Contemporary History 40 (2005), 308-309. ^ Susan E. Reid, "Women in the Home" in Women in the Khrushchev Era, Melanie Ilic, Susan E. Reid, and Lynne Attwood, eds., (Houndmills: Palgrave Macmillan, 2004), 153. ^ Susan E. Reid, "Destalinization and Taste, 1953-1963," Journal of Design History, 10 (1997), 177-78. ^ Susan E. Reid, "Cold War in the Kitchen: Gender and the De-Stalinization of Consumer Taste in the Soviet Union under Khrushchev," Slavic Review 61 (2002), 216-243. Polish October, also known as October 1956, Polish thaw, or Gomułka's thaw, marked a change in the politics of Poland in the second half of 1956. 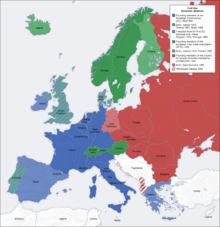 Some social scientists term it the Polish October Revolution, which, while less dramatic than the Hungarian Revolution of 1956, may have had an even deeper impact on the Eastern Bloc and on the Soviet Union's relationship to its satellite states in Central Europe.